Welcome to The Plymouth Fun Casino Company - We are a professional Fun Casino Company based in Plymouth and are ideally situated to cover Plymouth and the surrounding areas such as Plympton, Plymstock, Ivybridge, Saltash, Tavistock, Okehampton, Launceston and Liskeard. We offer Roulette, Blackjack, Casino Stud Poker, Chuck a Luck, Wheel of Fortune and Punto Banco (Baccarat), ideal for private and corporate events including weddings, birthdays, Christmas parties, product launches and charity fundraising events. 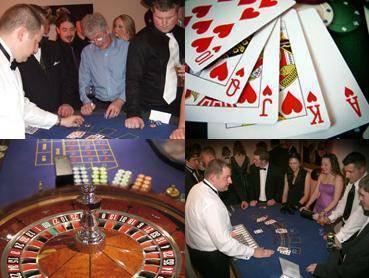 What better way to entertain your guests with a fun casino supplied by The Plymouth Fun Casino Company. It is perfect for involving everyone even your younger guests will be able to join in the fun, without risk, as no real money is used. What better way to entertain your clients, employees and guests than with a Fun Casino supplied by The Plymouth Fun Casino Company. It is perfect for involving everyone. Anyone that attends your fundraising/charity night can purchase Fun Money Vouchers from either the casino manager or a nominated member. Alternatively you may wish to give each of your guests a “Taster” voucher. This is a voucher which has a small denomination to allow your guests to get started and entice them to play on. Once they have spent their free chips, they able to purchase more from the Casino manager or the nominated cashier. Guests can buy as much money as they like at any one time or return throughout the evening to purchase more. If you planning to celebrate a Birthday, Anniversary, Engagement or merely throwing a party. 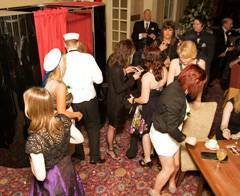 Fun Casinos are perfect to entertain your guests either as a stand-alone attraction or to compliment a Disco/Band.